The two bikes of the Austrian brand, the official and its new satellite of Tech3, have a design traced to the Formula 1 of the energy drink. A image and likeness of Formula 1, on the MotoGP grid will also be two teams representing Red Bull. It will be at the hands of KTM and its new satellite team, the Tech3, that Yamaha left to associate with the Austrian brand. And so that the parallelism between both championships is even greater, the four bikes will have designs traced to those of their brothers of the four wheels. This is what they have seen in the official presentation of the structure that was carried out in its factory of Mattighofen. 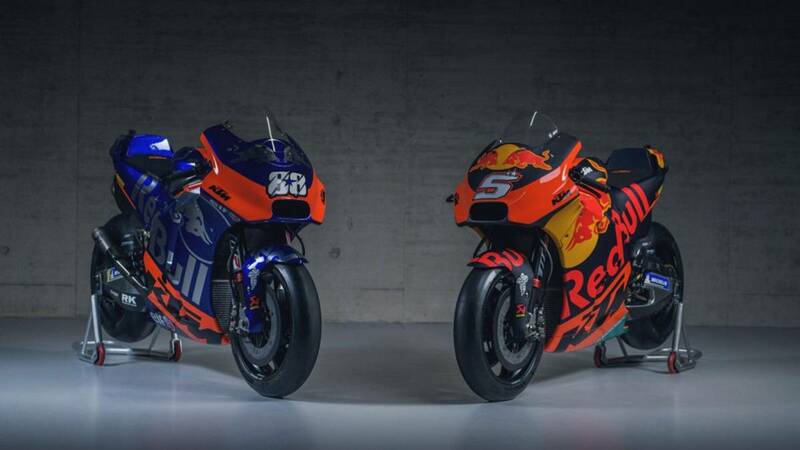 The official RC16 that Pol Espargaró and Johann Zarco will wear looks identical to those of last year, with the characteristic tones of their sponsor energetic (blue, red and yellow), while the satellite KTM of Miguel Oliveira and Hafizh Syahrin adopts a blue and silver pattern. That is, the main team would be like Red Bull and the support team like Toro Rosso. "This is a five year program and by the end we want to see podiums. For this season I would like to see results in single digits", says Stefan Pierer, the CEO of the brand. Y is that the important change for KTM in 2019 they expect great progress is the fact of having a support structure, something already had the strongest brands. That's what everyone highlights and Pol does: "We have a great goal this year and I think we are in good place. All the information that the Tech3 guys can bring will be useful for me, for the team and for all I know, from my experience, that Tech3 is good to help and teach the riders and also to improve the bike. " In addition, the Spaniard talks about his new partner:" Johann has integrated well and you can see him I hope to learn from him to be a better driver and worker, I just want to give my best in 2019 and as much as I can for the team. " For his part, the Frenchman is excited about his new challenge: "I feel that the people of the team trust me, we have done a good job, so the motivation is high I would say that I am a fast driver, so I can give good information and I am very proud to be part of KTM. " " It will be a great challenge, but we hope to continue the path to the top. "We should be able to wait for some positive moments this season," says optimist Mike Leitner, director team. And it closes the round of declarations Pit Beirer, director of KTM Motorsport: "In MotoGP two bikes are not enough to be able to develop technology up to the highest level, so having a second team gives us the incredible feeling that our system is in place. " A Red Bull has worked in F1, they also want to look like that.